ST. GEORGE — A two-vehicle crash in St. George triggered by possible reckless driving sent one driver to jail and left the occupants of the other vehicle shaken but uninjured Sunday night. 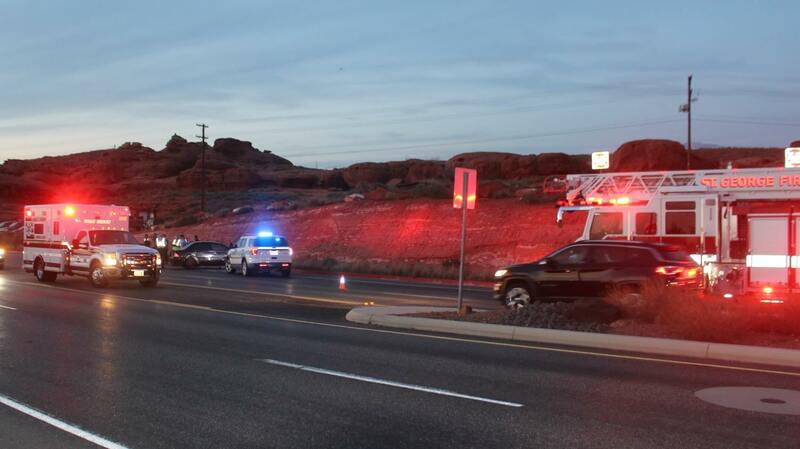 At 7:45 p.m. emergency personnel responded to the crash on Red Hills Parkway just east of the Dixie Sugarloaf involving a black Mitsubishi passenger car and a silver BMW. Responders arrived to find the Mitsubishi halfway on the sidewalk partially blocking westbound traffic, while the BMW was stopped in the center turn lane. All occupants were checked by medical personnel and reported they were uninjured. 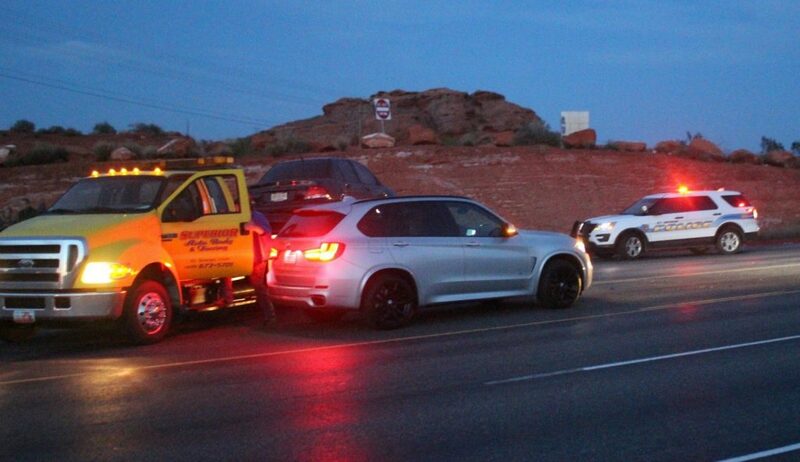 At the time of the crash, the BMW was heading east on the parkway in the outside lane when it was sideswiped by the eastbound Mitsubishi, which had failed to negotiate a curve while “traveling at a high rate of speed,” St. George Police officer Joe Deim told St. George News at the scene. The Mitsubishi driver lost control of the car as it spun around and careened across three lanes of travel before crashing into the sidewalk on the westbound side of the parkway. According to several witnesses at the scene, the Mitsubishi was traveling “very fast,” with one witness saying the car was going at least 100 mph. A family visiting from Salt Lake said they heard the initial impact, describing how when they looked toward the parkway they could see the Mitsubishi “veering all over the road.” They said the BMW likely saved the Mitsubishi from going off the cliff. Deim said emergency dispatch received a call reporting the car being driven recklessly just before the crash was reported. The driver of the Mitsubishi was given a field sobriety test at the scene and was subsequently arrested on suspicion of DUI. He was transported to the hospital for medical clearance before being being booked into Purgatory Correctional Facility in Hurricane. The Mitsubishi sustained extensive damage and was impounded.